In Saudi Arabia, Pompeo met with Saudi King Salman, the crown prince and the foreign minister. "In each of those meetings I stressed the importance of them conducting a complete investigation into the disappearance of Jamal Khashoggi. They made a commitment to do that," he told reporters travelling with him after boarding the plane for Ankara. Turkish officials have said they believe Khashoggi was murdered and his body removed, which the Saudis have strongly denied. Khashoggi was a U.S. resident who wrote columns for the Washington Post and he was critical of the Saudi government, calling for reforms. Earlier, in a Twitter post, Trump said Saudi Arabian Crown Prince Mohammed bin Salman denied knowing what happened in the Saudi consulate. "I think we have to find out what happened first," Trump told the Associated Press in an interview on Tuesday. "Here we go again with, you know, you're guilty until proven innocent. I don't like that." How the crown prince, often referred to as MBS, emerges when the dust settles over Khashoggi's disappearance is a test of how the West will deal with Saudi Arabia in the future. At issue will be to what extent the West believes responsibility lies with MBS for Khashoggi. "They made no exceptions to who they would hold accountable. They were very clear: they understand the important of this issue, they are determined to get to the bottom of it," Pompeo told reporters. But there has been mounting criticism of some of the prince's moves. 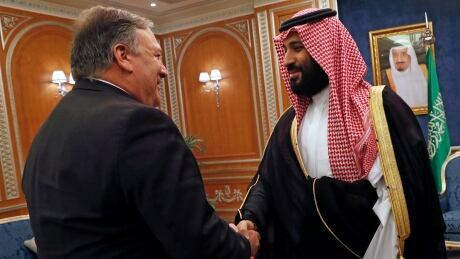 These include Riyadh's involvement in the war in Yemen, the arrest of women activists and a diplomatic dispute with Canada. The kingdom also denied an assertion by France that it held Lebanese Prime Minister Saad al-Hariri captive in November 2017.